Today Saturday 27 January 2018 decided to explore some new trail on Hong Kong Island so we took the number 14 bus and alighted just before the Tai Tam Reservoir bridge opposite this bright pistachio green building and walked backwards on the road towards a path. Duration: 3 hours approximately 8 km. How to get there: Take the number 14 bus that goes to Stanley and alight at the Tai Tam Reservoir (N) bus stop just before the bridge starts. Walk backwards and you will see the sign of a trail. Keep walking till you come to the trail sign and walk down the slope. 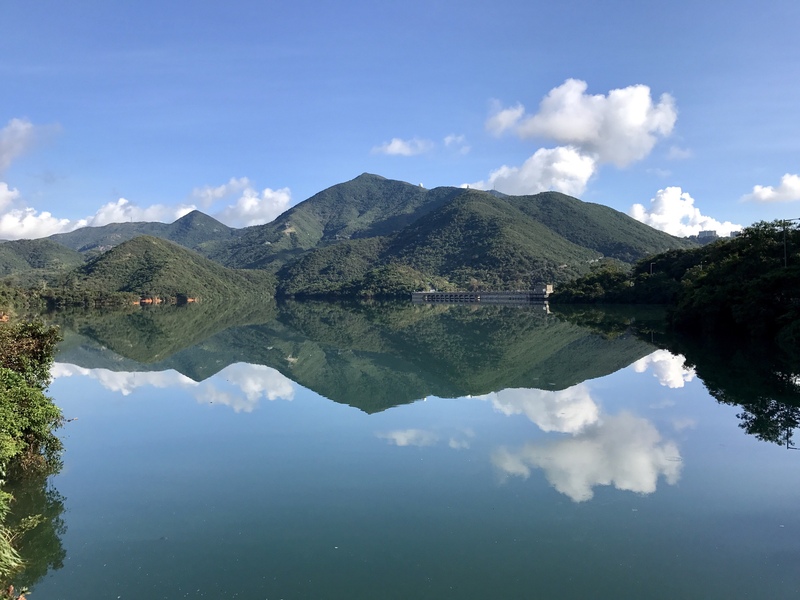 You will pass the Tai Tam Catchment reserve. Just walk straight. Whilst we walked on this trail we came across distance posts like on most trails. look out for these as then you know you are on the right path. We came across a cave from the path and a very ‘foresty’ area. Just keep walking straight. We continued walking and caught some lovely sights. We also saw some orange fruits. We couldn’t understand if they were persimmons or some mandarins. And we also sighted the Tai Tam reservoir bridge from the trail. We saw boats and the lovely blue water from uphill which actually looks grey as it was not a very bright day. It was cloudy and there was a drizzle. We walked against the railing and continued on the trail. And walked…We spotted the a Temple from above and curiosity got the better of me and I pulled my two cronies with me and we took a detour, we turned right and walked down a slope. We kept walking straight and finally came to dilapidated houses and a field alongside an expanse of water. This was an eerie part, very dirty, loads of garbage strewn around but I wanted to visit that beautiful yellow temple. However we came across two huge dogs that kind of scared us a bit but they just sniffed me… I guess they smelt dog on me too . I hurriedly visited the temple clicked a crooked picture asked the guy there how to carry on up the hill and went on my way. Finally we came to the end of the Hong Kong trail board and took the left and walked down. We reached the To Tei Wan beach. We sat on the rocks and had some lovely piping hot tea. Finally we walked up the never ending steps near the board that stated Dragon’s back trail. We climbed and climbed till we reached the number 9 bus stop back to Shaukeiwan. And yes our lovely hike came to an end. This is a lovely long walk…lovely sights, lovely sounds, the beautiful beach was the icing on top. But stick to the trail, if frightened of village dogs….